Not Mars as it is - airless, most likely lifeless, with only the faintest hints of what might have once been a damp, if not necessarily lush and living, world billions of years in the past. No, this is Mars as it should be and as it was once imagined to be - an ancient, dying, but net yet dead world, a world where a vast canal network reaches from pole to pole, bringing water and life to vast and fantastic cities. 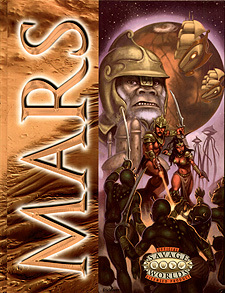 A Mars where albino apes run a vast empire in the last surviving jungle, a world where warrior tribes of Green Martians raid the outlying cities of the canal dwellers, a world where, in places dark and quiet and forgotten beneath the surface, ancient and terrible intellects plan dark and dire deeds. It is a Mars of pulp fiction and Saturday morning serials.